Tanzania’s campaigning anti-corruption Home Affairs Minister, Augustine Mrema, received US$ 1,000 and £4,000 during a visit to Europe in October. The money was to help him to open a private foreign exchange account and was allegedly meant to secure favours from his office. The Minister declined to name the people who had given him the money but stated that they were private businessmen with vested interests in the country. “I was very disappointed by the attitude of those people” he said, adding that he had, upon returning to Tanzania, converted the foreign currency into Tanzanian shillings and opened an account at the National Bank of Commerce. He said that he was going to use the money to reward whoever gave him tips on individuals receiving bribes. “I have set aside this account specially to deal with corruption” he underlined. Commenting on generalised foreign exchange racketeering, Mr Mrema said that the solution was to authorise Tanzanians; to hold private accounts in foreign currency within the country – Daily News. The Minister has been active in other directions too. After receiving complaints from citizens in Marangu, Moshi, about certain administrators, he has told them to stop harassing women who have bought commodities from markets in a neighbouring country. He said that the habit of searching women should stop. He was more interested in the big-time border smugglers whose names were known. On November 3rd he received a commitment from Dar es Salaam transporter Amiral Somji to the effect that Somji would repay, in six monthly instalments, Shs 30 million in duty on imports of textiles that he admitted having evaded during the last three years. Later in November he participated in the newly established Sungusungu (traditional defence groups) ‘night patrols’ being organised in Dar es Salaam against burglars and bandits. At a full meeting with the Tanzania Journalists Association he accepted the award of ‘Newsmaker for June 1991′ and expressed his appreciation of the help he was receiving from the press in rooting out corruption. He also gave the Dar es Salaam based firm Cargo Master International Ltd seven months in which to pay Shs 4,52,732,613 customs and sales tax it had been evading. In the event of failure to pay the firm would be taken to court. One man who walked 75 kilometres from Bagamoyo to Dar es Salaam just to thank the Minister for doing a good job said that he was really a ‘Black Jesus’. The Minister for Home Affairs (‘Mambo ya Ndani’) explained in some detail the background to his anti-corruption drive when he addressed a packed meeting at the Tanzania High Commission in London on October 22nd 1991. The address was characterised by the vigour of its presentation, the liberal use of emotive words ‘dhuluma’ (swindling), ‘haki'(justice), ‘usawa’ (equality), ‘kushirikiana’, (to cooperate) in the ‘vita’ (war) against corruption of all kinds. “I will never let you down” he said; the speech was also notable for its great good humour and the emphasis placed on the rights of women – “We are very serious about this – we will use State machinery to help women”. He said that he was determined to stop the beating of women by men and to defend women’s inheritance rights. Needless to say the speech was welcomed with acclamation by the women in the audience -“Why are you not applauding?” he asked the men who were present (laughter). He was asked about his encouragement of traditional guards (Sungusungu) to assist in security duties. Would this not usurp the role of the police? He said that the police could not be everywhere and that there were some similarities between the ‘Sungusungu’ in Tanzania and the ‘Neighbourhood Watch’ schemes in Britain. Another participant said that Tanzania needed many more Mrema’s. Mr Mrema couldn’t deal with all the corruption by himself. The Minister replied that he had many supporters able and willing to keep up the good work. It was up to everybody to take part in the anti-corruption campaign. There are now about 100,000 orphans in Tanzania whose parents have died from AIDS, President Mwinyi announced recently. Furthermore, he said that there were many elderly people left behind as destitutes following the death of their sons and daughters due to AIDS. Some 500,000 women – 8% of all women of child bearing age were said to have developed the HIV micro organism which triggers the deadly disease. “We have to be frank about this situation” he said. “Unless something is done soon, AIDS threatens to wipe out our nation”. He said that AIDS was not only a medical problem but a serious disaster which demanded a multi-sector approach – Daily News. Things are changing politically in Tanzania just as they are in almost all other African countries. Once famous names have come back into the limelight Fundikira, Kambona, Hamad during recent weeks and new names like Mapalala and Marando, and, dramatically, after his massive election victory, Zambia’s new President Frederick Chiluba, who said, during an official visit to Dar es Salaam: “I am not here on a mission to propagate my country’s style of democracy” . The pressures on the Presidential Commission on Political Change (Bulletin No 40) whose work is now drawing towards its end, must be very great indeed. There remains a wide divergence of view between those wanting Tanzania to become a multi-party state and those wishing to preserve the one-party status quo. What is more, the advocates of the multi-party system have also begun to show divergences of view amongst themselves. A ‘Steering Committee for a Seminar on the Course of Transition to Multi-Party Democracy’ had been held in Dar es Salaam on June 10th. It was chaired by Tanzania’s one-time Justice Minister Abdullah Fundikira and included Mr James Mapalala (Vice-Chairman) and Advocate Mabere Marando. Mr Mapalala is said to have been several times detained in the past on account of dissident ideas. The result of the seminar was the formation of a ‘National Committee for Constitutional Reform’ (NCCR). In August the Dar es Salaam ‘Business Times’ reported that former Foreign Minister Oscar Kambona, who had also been campaigning for a multi-party system, had been trading acrimonious accusations against Chief Fundikira while they had been in America fund raising. Fundikira was said to have told Kambona, who has lived in Britain for many years, that he was out of touch with the current situation in Tanzania. On September 6th the ‘Business Times’ reported on its front page that 27 people had been arrested for an unlawful demonstration the day before. They were arrested after marching on the Ministry of Home Affairs in support of a new political group entitled ‘Chama Cha Wananchi’ (Party of the People) said to be led by ‘civil rights campaigner ‘James Mapalala. The Minister for Home Affairs was later quoted as saying tha the highly regretted this new situation in which a few people deliberately disobeyed laws and regulations laid down by Parliament. The 27 people, who were held on remand, then apparently went on hunger strike but it is believed that they were subsequently released. registration of a new ‘Union for Multi-Party Democracy (UMD)’. Next came the announced intention of the National Committee for Constitutional Reform (NCCR) to hold a demonstration in support of the landslide victory of the Zambian Movement for Multi-Party Democracy (MMD) in that country’s elections. Immediately afterwards, on November 13th, the Tanzanian Government issued a statement saying that legal action would be taken against anyone participating in illegal demonstrations. On November 24th Home Affairs Minister Augustine Mrema stated that Messrs Fundikira and Mapalala had been arrested two days earlier but had been released after questioning and search. The proposed demonstration had been called off in the wake of a warning by Mr Mrema that the government would flex its muscles to repel the illegal gathering. The Mnazi Mmoja grounds, where NCCR Chairman Marando was to have received the demonstrators, had been surrounded by police. Subsequently it was revealed that Chief Fundikira’s UMD Party wished to take the Inspector General of Police to court for his failure to return the Party’s properties seized earlier after a police search. On November 22nd former Chief Minister of Zanzibar, Seif Shariff Hamad who had been held on remand in prison for some two years in connection with attendance at illegal meetings, was released on bail of Shs 2.5 million. He complained of having been subjected to psychological rather than physical torture during his time in prison. Information for this article was extracted from the Daily News and Business Times – Editor. Mwalimu Nyerere has stated that Tanzania is ripe for political pluralism and has urged CCM Party leaders to initiate peaceful transition. He told journalists at his Msasani residence in Dar es Salaam that, although the majority of Tanzanians supported the CCM, there was a substantial minority which wanted the constitution changed to allow pluralism. He believed there were serious, patriotic people, some of them inside the CCM, who could form a viable opposition party once permission had been given. However, a sound opposition leadership was yet to emerge, he added Sunday News. As we went to press the Kenya Television Network reported that Mwalimu Nyerere had urged multi-party supporters in Tanzania to form at least three opposition parties but not thirty as had been done in a number of African countries reverting to multi-partyism. Observers were said to believe that Nyerere’s sentiments could lead to quick changes in sections of Tanzania’s electoral laws to usher in multi-party democracy. On December 23, 1991 a Reuter report from Dar es Salaam stated that President Ali Hassan Mwinyi was facing mounting pressure for political change in Tanzania and was almost certain to legalise opposition parties after the Presidential Commission on Political Change reports in March 1992. The news item quoted a Western diplomat as saying that “They’ve already decided what the answer is and they are now writing the report to fit in with that”. The item went on: ‘The countdown to pluralism has sent the normally complacent CCM party into a frenzy of campaigning activity to recruit members and to raise funds for development projects. Minister for Regional Administration and Local Government and former Prime Minister and First Vice-President, Joseph Warioba, lost his Parliamentary seat in October after the nullification of last year’s election results in the Bunda constituency. Declaring the seat vacant before a packed Musoma Cultural Centre audience, the Chairman of the Electoral Commission said the complainant who had opposed him in the election, Mr Ramadhani Mkondya, had not been afforded a fair and equal opportunity to be elected by Bunda District CCM Political Committee. Counsel for Mr Warioba had submitted that, as Prime Minister, he was entitled to ceremonial privileges inherent in his post. The complainant said that Warioba had used Party and Goverment machinery to influence voters. In mid-December it was announced that Mr Warioba was one of five candidates hoping to re-contest the seat in the forthcoming by election. Although final figures were not available at time of going to press it is apparent that the 1990 – 1991 cotton crop has been the highest in nearly three decades. By November 11th the Tanganyika Cotton Marketing Board had collected some 458,000 bales and the General Manager of the Board, Mr Timothy Shindika, said that the total could reach 500,000 bales. Businessmen in the private sector exported goods worth US$ 169.34 million in the 1989/90 and 1990/91 financial years, the Minister of State in the President’s office , Prof Kighoma Malima, has announced. This was, he said, 19% above the target. The Daily News reported in its November 1st issue that a South African Airways (SAA) plane was expected in Dar es Salaam – the first flight to the country since Tanzania’s independence. The plane came to collect more than 100 exiles living in Tanzania. Meanwhile, the Business Times, in a front page article quoting the Director General of the Board of External Trade, wrote that Tanzania was running out of time to penetrate the important South African import/export market. Others were reported to have said that, as late comers, Tanzania could find most of the trade and economic opportunities taken up by competitors. Tanzania, unlike other SADCC countries , was said to be placing politics above economic realities. Representatives of two donor agencies have been making some surprisingly critical remarks recently. The Swedish Development Agency’s Head of Development Cooperation, Mr Bo Westman, announced in September that SIDA was temporarily blocking funds meant for development activities in Tanzania, pending publication of all grants in public accounts and explanations on the ‘misallocation of funds by the Treasury to unintended projects’. And the outgoing Director of the US Agency for International Development (USAID) Mr Jo Stepanek, in a ‘Monograph on Tanzania’s Development’ stated that ‘the corrosive forces of population growth and public corruption are severely undercutting Tanzania’s ability to produce and to govern. Donor dependence sustains the elite as it threatens sovereignty’. Tanzania has earned an international reputation as a leader in the field of wildlife conservation and is world famous for its national parks and wildlife. Nearly a quarter of the country is under some sort of wildlife protection order. Despite this Tanzania is the second largest exporter (after Senegal) of wild caught birds in Africa. The bulk, if not all of Tanzania’s wild bird exports, are of its own native species, unlike some Far Eastern exporters/markets. There are over 200 registered bird and animal exporters. The main trade is in Estrilid finches (waxbills, cordon bleus etc), weavers, bishops, whydahs and, to a lesser extent, native parrots especially the endemic Fisher’s Lovebird. Large bird exports are dominated by flamingoes, storks (especially marabou), ibises and crowned crane. Trapping appears to be centred in Dodoma, Shinyanga and Kilimanjaro regions with holding grounds in Arusha and Dar es Salaam. Increasing concern is being expressed in Tanzania and internationally about the welfare and conservation aspects of the trade. It should be stressed however that the bulk of the Tanzanian trade is legal, according to Tanzanian and international law. But there is evidence of some illegal acts being committed. Studies of the wild bird trade elsewhere have shown that there are huge losses suffered at capture, in the holding grounds and whilst being transported and there is no reason to suppose conditions in Tanzania are any different. In a well publicised case recently at least 1,200 birds died miserably on a flight from Tanzania to Heathrow. In 1982 a report by Kim Howell of the University of Dar es Salaam made a number of recommendations which helped to stop the trade in the yellow-collared lovebird (only found in a wild state in Tanzania). In 1948 Moreau (the doyen of African ornithology) commented on the huge numbers of lovebirds being exported (40-50,000 per annum) and in 1987 and 1988 a total of 183,607 live imports of lovebirds were reported, Tanzania being the source of the majority. 43% of birds imported into Britain from Tanzania in 1988 and 1989 were of unidentified species. Whilst there may be some excuse for not identifying non-breeding plumage whydahs or weavers there should be no excuse for not identifying families such as bar bets, starlings, coots, mousebirds, turacos, hornbills, flamingoes, lovebirds, rollers, waders and orioles. Earlier this year a joint campaign was launched by the Royal Society for the Protection of Birds, the Royal Society for the Prevention of Cruelty to Animals and the Environmental Investigation Agency to ban the import of wild caught birds into the EEC. The USA has already decided to phase out all imports of wild caught birds. As a result of concerns about the current population status of Fischer’s Lovebirds, the CITES EEC Committee imposed a temporary ban on the import into EEC countries of these birds on January 16th 1991. Many airlines (including KLM and BA but not Egypt Air and Air Tanzania) have banned the carrying of wild caught birds. There is also currently a MAFF imposed ban on all bird imports into Britain from Tanzania. A consignment of Tanzanian birds in 1990 was found to contain Newcastle Disease and this ban will continue until the Tanzanian veterinary authorities satisfy the British that their procedures are adequate. The islands of Zanzibar and Pemba, on account of their geographical location off-shore and their differences of history and ecology, their economic performance and their growth prospects, differ somewhat from those of the mainland. Zanzibar has a population many times as dense as the mainland outside Dar es Salaam, that in Pemba being 40% greater even than Unguja. Population growth is now believed to be running at about 3% overall, a rate of growth greater in Unguja than in Pemba. Today the islands are estimated to have a joint population of 680,000 and an average population density of 260 per square kilometre. Zanzibar does not suffer from the problems of sheer distance which seriously affect economic activity on the mainland. On the other hand, for historical reasons, the economy of Zanzibar depends substantially on a single export crop, cloves, the export of which is still responsible for 90% of Zanzibar’s foreign exchange earnings. In the sixties the export of cloves, of which Pemba was the main source, earned Zanzibar a healthy foreign exchange balance. But times have changed. Zanzibar has lost its near monopoly advantage and in common with other tropical export crops the price of cloves in world markets has fallen drastically. The volume of export sales fell from 10,800 tonnes in 1973 to 3,510 in 1990. At the beginning of the eighties cloves were selling at $3,000 per tonne, but by the end of the decade the price had fallen to $2,000 per tonne. This state of affairs has been reflected in the unfavourable balance of trade that has arisen since 1986 with a deficit of Shs. 859.17 million, rising to Shs. 4,037.98 million in 1990. The disastrous effect on the balance of payments has severely constricted the country’s ability to import food, medicines, raw materials, machinery and other necessary items and has only been mitigated by foreign import support estimated to amount to Shs 9,294 million over a period of 5 years, rising from Shs. 692. 4 million in 1986 to Shs 4,942.24 in 1990. No country, certainly not Zanzibar, welcomes this degree of economic dependency. Zanzibar’s trade with the mainland of Tanzania has, on the other hand, been increasing in recent years. From a deficit of Shs 48 million in 1987, trade went into a surplus of Shs 689.7 million in 1990. This favourable trade relationship, if continued, will help to ease the liquidity problems that have encumbered the Zanzibar economy in recent years. Moreover, as the mainland economy develops, the range of products for which Zanzibar will be able to look to the mainland will gradually increase. The maintenance of the surplus is therefore crucial for Zanzibar . One way in which it can be maintained is through a reduction of food imports from mainland Tanzania by increasing local production. A policy along these lines is well in hand, but in view of rate of population increase, it is by no means easy to achieve results. The rising population growth and falling gross domestic product during the eighties resulted in a marked fall in the standard of living in monetary terms. In 1976 the average GDP per head was in the region of Shs 2,240, falling to Shs 1,188 in 1989. Over the same period the contribution of agriculture to the GDP fell from Shs 572 million in 1976 to Shs 384 million in 1989. The inhabitants of Pemba are especially vulnerable. Near complete dependence on cloves exposes them to a real risk of hunger when the harvest is poor and the dominance of cloves in the economy of Pemba acts as a disincentive for private investment on the Island. As in mainland Tanzania, the solution to the foreign exchange problem lies mainly in the Islands’ ability to diversify exports. This will call for unremitting effort over a substantial period of time. The present scope accorded to private enterprises will help to stimulate non-traditional exports by providing room for initiative, but it would be misleading to suggest that such enterprises can become a major factor in Zanzibar’s foreign trade in the short term. Meantime, the Zanzibar Government is pressing for increased food production within the short term. With the ultimate goal of self-sufficiency in food, the Government has launched a programme called “Mtakula”, which has already shown some results. The programme includes diversification into such products as cardamom, red pepper and other agricultural items for export. In the industrial field, current plans provide that any expansion and any new enterprises are designed to reduce reliance on imports. At the same time the Presidential Commission of Enquiry into the Monetary and Banking System of Tanzania has included within the scope of its recommendations the Zanzibar People’s Bank and measures to alter its status and its efficiency are under consideration. The Plan for Economic Revival in Zanzibar of 1988 resembles in broad outline measures now being taken on the mainland. The budget for 1988/89 showed savings of 5.41. in comparison with the previous year; subsidies were removed from foodstuffs such as rice, sugar and wheat flour; there has been a reduction in government employment brought about by retirement and the control of new appointments; banking services are being extended by opening branches throughout Unguja and Pemba; new impetus is being given t o a law of 1986, which aims at stimulating the activities of domestic and foreign companies; and a study is being made of such matters as a free port , an export processing zone, off-shore investment and banking and ship registration. Following a relaxation of trade regulations, substantial benefits have been recorded, including a growth of activity year by year among individual traders. Government plans give careful attention to measures designed to mitigate the adverse effects of structural adjustment and provision has been made for investment in the economic and social infrastructure. An interesting component of social policy is the attention that is given to widening the productive opportunities open to women and also the attempt made to harness for productive purposes the energies of young people. An independent foundation known as Mfuko wa Kujitegemea has been established under the Land Perpetual Succession Act to collect funds from all manner of voluntary sources for the purpose of providing soft loans for promotion of productive enterprises. Priority is given to unemployed men, women and young people, to the development of the informal sector and to assisting the handicapped and the underprivileged. ‘At Tanzania’s National Museum in Dar es Salaam a mouldy exhibit depicts a 1958 speech by Julius Nyerere in which he proclaimed the birth of a new band of socialism’. So began an article in the October 10th issue of the INTERNATIONAL HERALD TRIBUNE which went on to state that, nearly three decades later, socialism in Africa is all but dead, a victim of economic failure, abuses of power and political oppression. And with it an age of ideology appears to be dying as well – an impassioned era of dreams and promise … when socialism, Marxism and other leftist beliefs largely fuelled political thought and governance’ . ‘Today Africa is a far different place. Mr Nyerere now softly recommends that his people build a multiparty democracy on the wreckage of his socialist wasteland …. In a recent full-page travel article in the SUNDAY TIMES under the title ‘Out of Slavery’ Anthony Sattin recalled Stanley’s description of Zanzibar as the ‘Baghdad of East Africa’. The slave trade had guaranteed Zanzibar a place in our collective memory…. ‘There is still the coronation portrait of Elizabeth II mouldering in the museum with the bones of a dodo and a milestone in town announcing ‘London – 8,064 miles …. ‘ ‘Later I came to the House of Wonders and the seaside gardens laid out to celebrate the silver jubilees of a British king and a Zanzibar sultan. This is a popular place at sunset … it was a likely place for a rendezvous or a chance meeting, and beside me, watching the sun go down, sat a Syrian trader, sipping sweet tea and smoking a chain of cigarettes. I asked him about his trade and he said that, as his ancestors would have done, he moved this and that between his own country, the Gulf and Zanzibar. The Syrian and I drank tea and watched the sunset; the Southern Cross in the enormous red sky, dolphins playing around the returning dhows, their sails barely arched before the slack breeze … it occurred to me that for thousands of years, from the ancient Egyptians to famous explorers and forgotten captains, people have looked out on similar views before leaving the safe harbour for the farthest flung parts of the world. In a special report on German aid activities in Africa the September issue of NEW AFRICAN described ‘mother and child health services’ (MCH) in Zanzibar where there are now 88 MCH clinics. 85% of these offer family planning services but the user-rate of such services in rural areas is only 3% Research into the work of ‘Traditional Birth Attendants (TBA’s)’ showed that only 2% of those interviewed had attended primary school, only a third mentioned the importance of boiling their delivery equipment and 56% had never advised mothers on family planning. A training’ programme has now started. A second article quoted the case of one woman in Bagamoyo who had been advised by a TBA, after her 5th child, to use a ‘ Pigi’ , one of the traditional contraceptive methods – a small piece of wood tied to a string and worn round the woman’s waist. The woman soon had her 6th and 7th pregnancies ! Continuing its comparison of costs of products in different countries the October 1991 issue of BUSINESS TRAVELLER revealed that the price of an alcoholic drink at a bar is only some $2.41 in Tanzania which makes it the second cheapest place out of 36 countries quoted. Only South Africa had cheaper drinks. The most expensive drinks were are found in Sweden ($15 . 20). 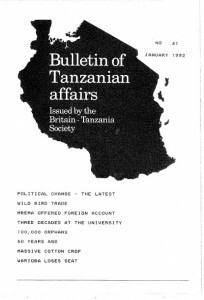 The November 1991 edition of the same publication dealt with the cost of a ‘business dinner’ and again Tanzania came out as one of the cheapest places in the world ($33). Pakistan ($15) was the cheapest and Japan far and away the most expensive ($136). Under this heading NEWSWEEK in its issue of September 16, 1991 pointed out that in much of Africa AIDS is a family disease. Sub-Saharan Africa has roughly equal numbers of men and women infected with the HIV virus. One of the illustrations was of a Tanzanian with his 13 grandchildren all of whose parents were said to have died from AIDS. Britain’s Overseas Aid Minister Lynda Chalker was the subject of a lengthy interview by Derek Ingram in the September 1991 issue of NEW AFRICAN. She commented on a number of places in the world where there had been problems with human rights (Sri Lanka, Somalia, Sudan) and was then asked, when it came to development, where in Africa was she most optimistic about. She answered that she was much more hopeful about Tanzania. President Mwinyi and his government were trying very hard to do the right thing. She was also hopeful about Ghana and Nigeria. Under this heading the ECONOMIST in its August 24th issue wrote about recent changes in the Soviet embassy in Dar es Salaam. Once this large embassy was stuffed with technicians, doctors and students of Marxism/Leninism. That was when the dictatorship of the proletariat…. was beating back capitalist monopoly imperialism in the exploited Third World. These days Soviet diplomats have other concerns. “We are looking for profit making … and trying to set up joint ventures” said a spokesman. But profit making was proving harder than expected. The article went on to describe the ferry link for the forty miles between Dar es Salaam and Zanzibar (‘but the Sea Express keeps on breaking down’), a transport company using 25 trucks imported from Minsk and a Latvian fishing boat with a few sailors• … ‘Cost cutting will be the next stop. Some Western embassies have been approached about employing Soviet technical advisers, paid a tenth as much as western expatriates’. The DAILY TELEGRAPH published a lengthy obituary on Major-General Kenneth van der Spuy in its issue of August 17. 1991. The Major General, who had just died at the age of 99 and who, in his earlier years, had taken a prominent part in setting up the South African Air Force, was summoned to the Kilimanjaro area of Tanzania in 1916 and immediately found himself involved in a war on two fronts – one against the German enemy and the other against the climate. malarial mosquitoes and local wildlife. He operated from an airstrip which became known as ‘Daniel’s Den’ because of the large number of lions that roamed around it. WORLD BANK NEWS in its November 21st issue stated that Tanzania has received an IDA Credit of US$200 million to ‘help in creating a financial system that operates on market oriented principles, is efficient in mobilising and allocating resources and fosters longer-term economic growth’. “We still see the bones of the birds when we mine the phosphates” said geologist Iryana Mwambete, working with the Minjingu Phophates Company some 100 kilometres south-west of Arusha and quoted in the October 1991 issue of NEW AFRICAN. The phosphate deposits are the remains of bird droppings and dead birds which lived in the area many. many years ago. There are 2.6 million tons of soft phosphates and 5. 2 million tons of hard phosphates in the area which surrounds Lake Manyara. The Minjingu phosphates were discovered in 1956 by an International Atomic Energy team while searching for uranium and the mining plant was installed with Finnish help. But today, according to the article, the Swahili saying ‘Ng’ombe wa masikini hazai na akizaa huzaa dume’ seems to be true of the Minjingu phosphates. The company employs 150 workers but had to stop production for two months due to lack of market. The plant has a capacity to 100,000 tons per annum but since its inception in 1983 has been producing only 20,000 tons each year. In 1990 however, for the first time, some 3,000 tons were exported to Kenya and large, but not small, farmers in Tanzania are now showing increased interest in using the fertiliser. Hollywood’s finest were said, by the DAILY TELEGRAPH in early September (in an article headed ‘Animal Crackers’) to be off on safari to the Serengeti and Kenya for charity. It was to be an unusual melange. Roger Moore, actress Anne Jackson, George Hamilton and ‘that delicate conservationist Sylvester Stallone’ were to be joined by veteran US newscaster Walter Cronkite, fashion designer Pierre Cardin, the Duke of Northumberland, conservationist Richard Leakey and Prince Bernhard of the Netherlands. The fee paying members of the party would each be shelling out £13,250. Tanzania, or at least its Zanzibar segment, achieved the unachievable as far as the British media are concerned on November 25th 1991. It found itself mentioned in huge full-page spreads in the SUN, DAILY MIRROR and STAR, repeatedly on virtually all channel s of TV and radio, and, in more sober style in the TIMES, DAILY TELEGRAPH, INDEPENDENT, GUARDIAN, INTERNATIONAL HERALD TRIBUNE and, no doubt, countless other newspapers and periodicals around the world . The occasion? The death (as a victim of AIDS) of Rock ‘Superstar’ Freddie Mercury. In every case considerable prominence was given to the fact that he had been born in Zanzibar under the name Frederick Bulsara. His father, who is of Persian origin, had been an accountant in the Zanzibar civil service. AFRICA CONFIDENTIAL in its October 11th issue reported on President Kamuzu Banda’s first ever state visit to Tanzania from October 3 – 6 1991. ‘While it did not result in the sort of rapprochment that followed Banda’s triumphant appearances at Zimbabwe’s 10th Anniversary celebrations in 1990 progress was made on transport links’. Writing in a recent issue of MEDICAL RESEARCH COUNCIL NEWS, Dr C. F Curtis of the London School of Hygiene and Tropical Medicine stated that up to 70% of Tanzanian children have malaria parasites in their blood at anyone time and people receive up to four malaria infective mosquito bites per night. He then went on to write about the highly successful use of insecticide-impregnated mosquito nets and, in Zanzibar, of a floating layer of expanded polystyrene beads to prevent mosquito breeding in pit latrines and cess pits. The November 1991 NEWSLETTER of the TANZANIA/UK BUSINESS GROUP in London reported on a speech given to the group on October 10th by Mr George Kahama, Director General of the Tanzanian Investment Promotion Centre. Mr Kahama had said that the Centre had become one year old in July 1991. It had compiled an investment register with profiles of some 90 companies and projects and had instigated investment promotion programmes in such countries as Thailand, Malaysia, Ghana, Kenya and the UAE. So far, 144 investment applications had been received and processed to a value of some 400 million US dollars. At the same meeting Mr Aziz Nasser was elected Chairman of the Group. In its January 1992 issue NEW AFRICAN reported on the latest climb of Mount Kilimanjaro by Major-General Mrisho Sarakikya, Tanzania’s Ambassador to Nigeria. The Maj-Gen has climbed the 19,340 ft mountain 30 times. But for the first time he found that the ‘last water point’, a stream high up on the mount ain was dry. “There is serious prolonged drought on the mountain now” he said. Tanzanian hydrologists were quoted as saying that the cause of the reduced water flows was not climatic change but because of rapid run-off of water as t e result of the loss of trees and plants. Last season the staple maize crop was destroyed in parts of Rombo district by rainwater rushing down the bare mountain side. URAFIKI TANZANIA, the journal of the Franco-Tanzanian Association in its issue No 49, wrote about the White Father Georges Paquet whom it described as a modest fifty year old full of drive. He was said to have two families: the White Fathers and the Tanzanian people – ‘those rare people in Africa who resolve their problems without violence’. The article went on: ‘That which attaches George to the Tanzanians, of whom 30% are Christians, is their spirit of solidarity, the way in which they use body language to express themselves and their ‘appetit religieux’. ‘ We have talked disparagingly about their traditional religion but these people do not love their traditional carvings any more than we love the statues in our churches’ the article said.